The USDA (US Department of Agriculture) has come up with a food pyramid for kids. It is called the MyPyramid for Kids. It is designed to be a guide to encourage children from 2 to 6 years to consume a wide variety of foods to promote good health. Five major groups of foods are emphasized, while the intake of excessive fat-rich or oily foods and sweets are discouraged. Basically, the food guide pyramid for kids acts as a guide as to the types of foods and the quantity a kid should consume every day in each food group. The important food groups in the kids food pyramid are grain, vegetable, fruit, dairy and meat. The fats and sweets group of foods should be consumed moderately. The grain group would supply kids with carbohydrates to provide them with the necessary energy daily. Foods that fall in this group are bread, cereals, rice, pasta, crackers and pancakes. The vegetable group provides kids with vitamin A to help with good vision. Vitamin C which heals wounds and fight infections is also available. Vegetables also provide fiber for a healthy digestive system. Among the foods in the vegetable groups are broccoli, cauliflower, lettuce, celery and also juices extracted from vegetables. The fruit group provides kids with vitamin C, A and fiber. Foods in this group include apple, grapes, bananas, papaya and berries, among others. The dairy group of foods help build strong bones and teeth and also provides nutrients like protein, vitamin A, vitamin D and B vitamins. Foods in this group include milk, yogurt and cheese, among others. The meat group of foods help build strong muscles by providing the body with sufficient protein and iron. Foods in this group include chicken, turkey, fish, beef and eggs, among others. Servings should be based on the kid’s appetite. If a kid doesn’t take kindly to a particular recommended food, try to find an appetizing alternative. That said, let’s look at the serving suggestions for the main food group. A child should consume up to six servings in the grain group. Servings include a slice of bread, ½ cup of cooked rice or ½ cup of cereals. In the vegetable group, your child should consume at least three servings. Servings include ½ cup of chopped or raw vegetables and a cup of raw, leafy vegetables. Two servings from the fruit group should be sufficient for a day. Servings can be chosen from among ¾ cup of pure fruit juice, ½ cup of canned fruit or a quarter cup of dried fruit or a slice of fruit like melon. In the dairy group a kid would require at least two servings. Servings would include a cup of either milk or yogurt or 2 ounces of cheese. In the meat group, 2 servings are recommended. Servings can be chosen from 3 ounces of cooked lean meat, poultry or fish. An excellent alternative would be an egg. 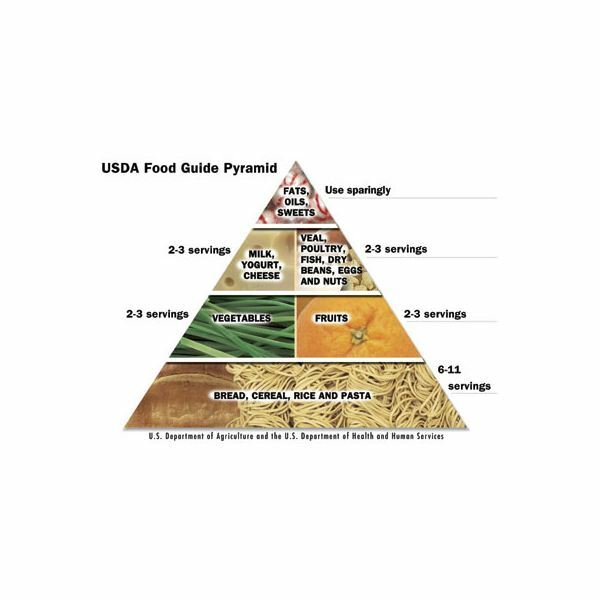 Food Guide Pyramid for Kids : Image courtesy of USDA.